The updated Intel Consumer Product Roadmap for the remainder of 2015 and the first half of 2016 has leaked out; courtesy of the folks over at XFastest forums. 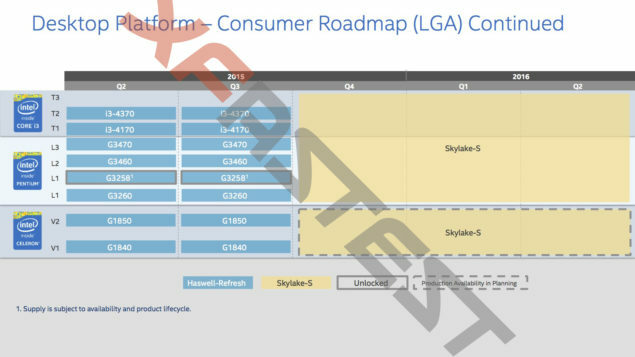 It not only confirms our previous leaks about the Skylake launch date (5th August) but reveals additional details about product placement and also confirmation on the Broadwell-E platform, which will feature up to 8 cores, all based on the 14nm Process. 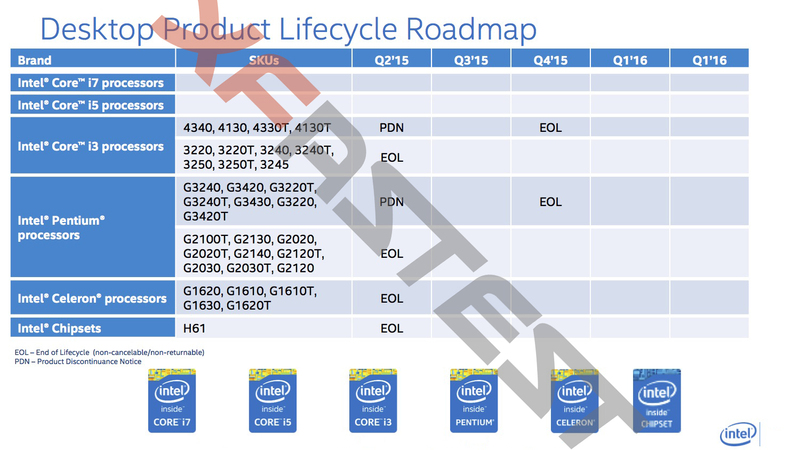 The product life cycle roadmap shows the Chipset (H61) and various SKUs approaching discontinuance. Lets start with HEDT platform. As we all know, the Ultra High End Segment is always named one step ahead of the mainstream segment in terms of nomenclature. So the i7 59XXX series, which forms the flagship processors of the Haswell-E platform will finally get an upgrade to the 14nm process from 22nm, in the form of Broadwell-E. Broadwell-E will start rolling out in Q1 2016, which is exactly what our previous leaks have depicted. While the exact nomenclature is not given, it is a very safe bet that these will be called the Core i7 6960X, Core i7 6930K and Core i7 6820K. Now in terms of the tier level that is mentioned in the roadmap, you are looking at the XE (Xtreme Edition) P2 and P1 segments (Performance Level 2 and 1 respectively). I have always called Intel’s nomenclature a giant wibbly wobly mess of numbers, and this roadmap is no exception. From the P1+ class and below, you can rely on the number depicting the generation. The P1+ class currently consists of the Broadwell based, Core i7 5775C (which I might mention is an unlocked multiplier processor contrary to what the lack of the “K” suffix might depict). The P1 and P1K classes contain the Haswell based Core i7 4790 and 4790 K; with the former simply being the unlocked variant. Now interestingly the P1+ segment will stay as it is throughout the year, whileas the P1 and P1K class will be refreshed to the Skylake variants (on AUgust 2015), namely the Core i7 6700 and 6700k. Below the Performance Class we have the MS or Mainstream Class, which includes MS2+, MS2K, MS2 and MS1 tier levels. The MS2+ tier level consists of the Broadwell counterpart which is the Core i5 5675C and will remain in play throughout this year and the first half of 2016. The MS2K, MS2 and MS1 tier levels, which consist of the Core i5 4690K, 4690 and Core i5 4590 respectively will be upgraded to their Skylake variants on August 5, 2015 and remain in play till the second half of 2016 at least. The MS2K tier level will be occupied by the Core i5 6600K, the MS2 tier level occupied by the Core i5 6600 and the final MS1 tier level will be occupied by the Core i5 6500 processor. Finally, we have the Traditional, Low End and Value segments which consist of the T1, T2, T3, L1, L2, L3, V1 and V2 tier levels. These form the low end spectrum of Intel’s offerings and will not be updated on 5th August 2015. Instead they will be updated directly to Skylake variants sometimes in the Fourth Quarter of this year – probably when the process has matured enough to warrant a shift of the bottom of the barrel. Now onto the second portion of our article. 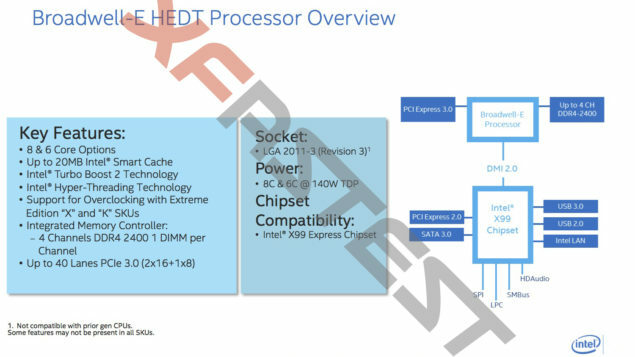 The detailed spec sheet of the Broadwell-E platform. 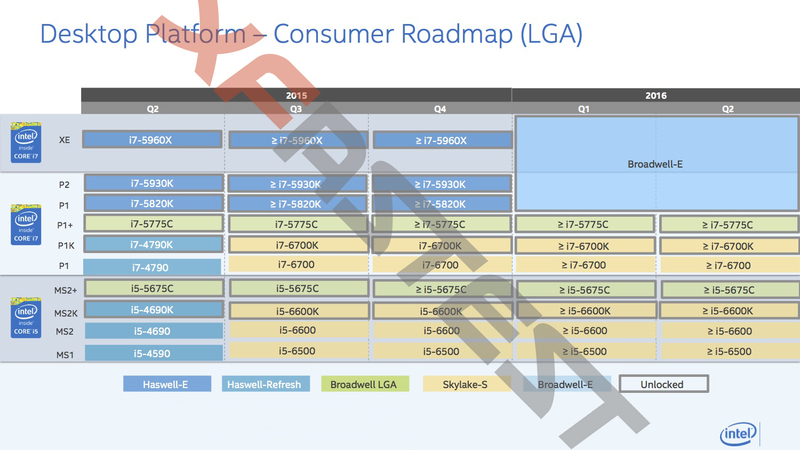 The Broadwell-E platform will house upto 8 Cores (almost certainly the Core i7 – 6960X) and a minimum of 6 Cores. at 14nm the flagship product should offer a significant upgrade in processing power as compared to the 22nm based Haswell-E platform. Thankfully, the socket remains the LGA 2011 Rev 3 and the chipset will be the Intel X99 Wellsburg chipset. The processors will have a maximum TDP of 140 Watts and will contain upto 20MB of L2 cache (Approximately 2.5 MB for each core at 100% usage). Ofcourse, both the X and K series processors will have unlocked multipliers and DDR4 memory support (2400Mhz natively without over clocking the memory controller). And if you are contemplating going for a Crossfire or SLI setup of more than 2 GPUs, you will most definitely need the last feature: 40 lanes of PCIE 3.0. The X99 Chipset Wellsburg will support CPU (Ratios and BCLK) and GPU overclocking and will have all the usual features such as Intel Rapid Storage and RST Smart Response Tech (and Rapid Recover too). It will have 14 USB ports and 10 Sata ports. Interestingly it will also feature Intel’s Integrated Clock Support. X99 will ship with support for AVX 2.0 and will also have the Fully Integrated Voltage Regulator.